2018 Kawasaki Ninja H2 R. Picture credits - Kawasaki. Submit more pictures. 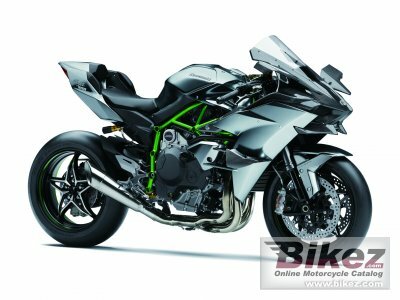 The Kawasaki Ninja H2�R hypersport motorcycle is an engineering marvel, made possible only through the sourcing of technological expertise from multiple divisions of Kawasaki Heavy Industries, Ltd. (KHI). The result of this unprecedented collaboration is a system of carefully crafted premium components and World Superbike racing inspired next-level electronics that work in concert to create an unbelievably powerful machine�one that�s more than worthy of the legendary H2 name. Price as new (MSRP): US$ 55000. Prices depend on country, taxes, accessories, etc. Comments: 326 hp at 14.000 rpm with RAM air. Kawasaki Corner Management Function (KCMF), Kawasaki Traction Control (KTRC), Kawasaki Launch Control Mode (KLCM), Kawasaki Intelligent anti-lock Brake System (KIBS), Kawasaki Engine Brake Control, Kawasaki Quick Shifter (KQS) (upshift and downshift), �hlins Electronic Steering Damper. Ask questions Join the 18 Kawasaki Ninja H2 R discussion group or the general Kawasaki discussion group. Get a list of related motorbikes before you buy this Kawasaki. Inspect technical data. Look at photos. Read the riders' comments at the bike's discussion group. And check out the bike's reliability, repair costs, etc. Show any 2018 Kawasaki Ninja H2 R for sale on our Bikez.biz Motorcycle Classifieds. You can also sign up for e-mail notification when such bikes are advertised in the future. And advertise your old MC for sale. Our efficient ads are free. You are also welcome to read and submit motorcycle reviews.